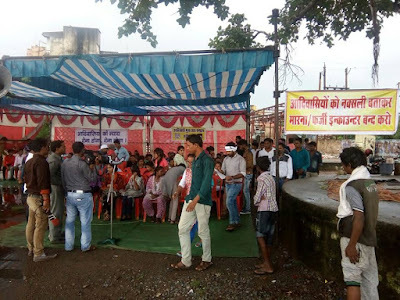 Pointing out that in the last seven months, “more than 100 adivasis” have been killed, the BSN says, the latest in the series is the “fake encounter” of two teenagers in Burgum. This happened following a “fierce encounter in Bastar between the state’s armed forces and Maoist guerillas”, it adds. Following this, says BSN, Agni, the local vigilante group, allegedly recently propped up by the state government and headed by a Vishwa Hindu Parishad leader, “complemented” the cops “for meeting the target of killing 100 Maoists as part of the Mission 2016”. “The two had gone to a relative’s house on September 23, from where they were dragged out in full view of their relatives, taken to a nearby forest and shot in cold blood. The relatives who tried to stop the police when they were dragging the two out were brutally beaten up”, BSN says. In a second example on July 5, BSN sites the instance of Situ Hemla, a tribal villager in Bastar, while he was working in his fields, was abducted by a team of security jawans along with others who had their faces covered. Later his dead body was found to be hanging from a tree. Then, on August 16, a 19 year old adivasi named Arjun Kashyap was killed in a “fake encounter” and then declared a dreaded Maoist leader. “The ridiculousness of the state’s claims can be gauged from the fact that Arjun was out on bail”, granted “he was not the same person as named in a police FIR.” According to BSN, “Sensing a possible defeat in the court case, the authorities simply decided to bump him off”, says claims.